Ezekiel Elliott, No. 21 of the Dallas Cowboys, celebrates Dec. 18, 2016, after scoring a touchdown by jumping into a large Salvation Army red kettle during the second quarter of a game against the Tampa Bay Buccaneers in Arlington, Texas. 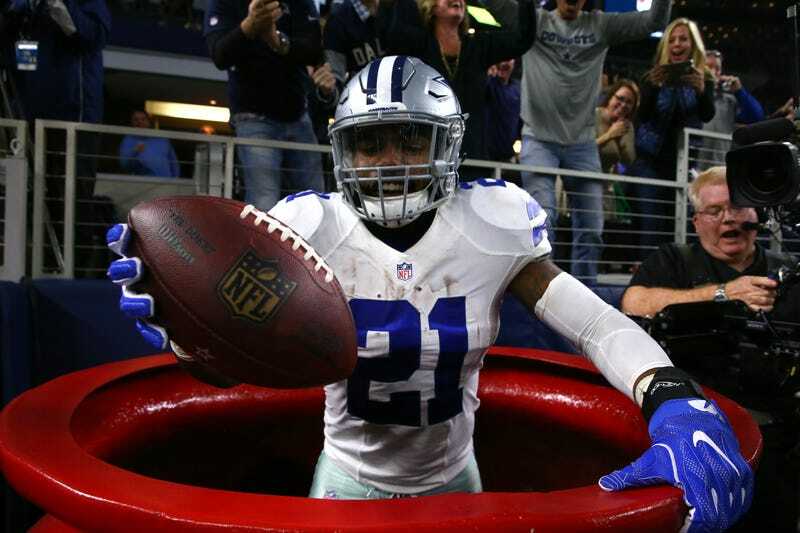 The NFL may not have approved of Ezekiel Elliott's touchdown celebration that included his jumping into a huge, red Salvation Army kettle, but the charity sure is happy. The Salvation Army believes that Elliott's stunt has resulted in a 61 percent increase in donations. The charitable organization told TMZ Sports that since Zeke's TD celebration, people have been making $21 donations in honor of Elliot's jersey number. "From 8:10 p.m. to 10:30 a.m. this morning, there was a 61 percent increase in online giving from the same time frame last Sunday night," Salvation Army spokesperson Lt. Colonel Ron Busroe told TMZ Sports. Busroe wouldn't spill all the tea, but he did note that Elliott also planned to make a donation. "We’re very thankful that he’s going to donate," Busroe said. Read more at TMZ Sports.